Several of you have been asking me, "When are you going to post the AFTER pictures from the Good Shepherd project?!" Well, the wait is finally OVER and I'm so excited to be sharing with you the final results of the room I had the pleasure of re-designing back in June. Just to quickly re-cap on the project: Earlier this year, project manager and organizers, Vanessa De Vargas and Vanessa Kogevinas, recruited 30 designers in the LA area to design and furnish 30 rooms at the Good Shepherd Center in Los Angeles, a center for homeless woman and children. 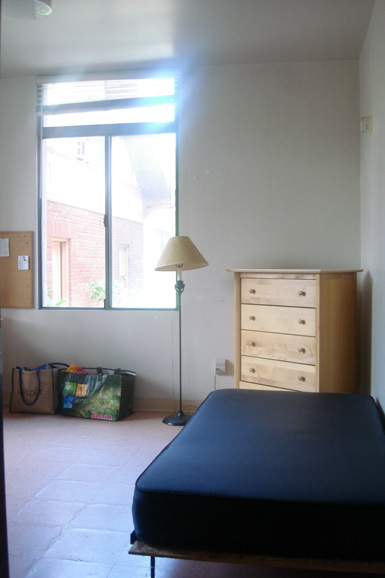 The units we worked on serve as temporary housing to help single women of all ages get back on their feet, after facing financial hardship, addiction, abuse, or any other unfortunate circumstance that contributed to them becoming homeless. 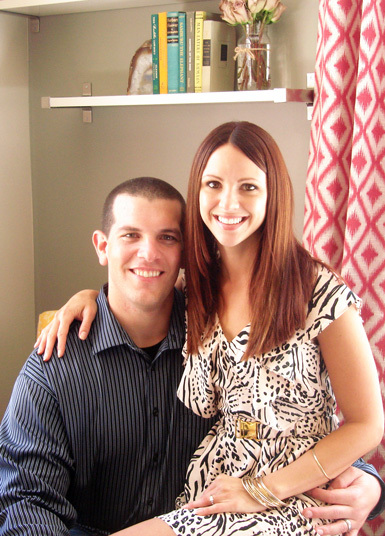 The project was 100% pro-bono and we all volunteered our time and resources to make it happen. 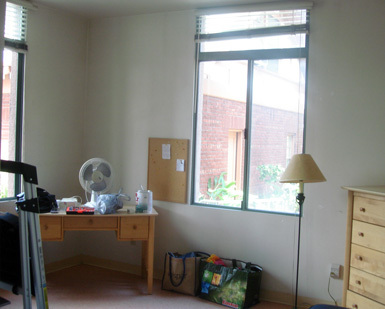 We had 30 days to completely transform our individual room, however we saw fit. This was hands-down, the most rewarding design project I have ever been a part of. It was a pleasure to work at a women's center staffed with the sweetest group of women and nuns. I also enjoyed meeting and becoming friends with several of the other designers who participated in this project. 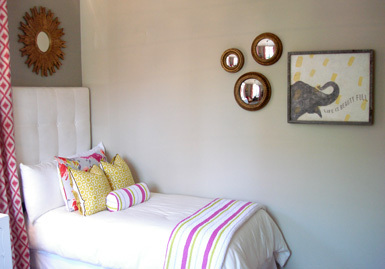 So, without further adieu, here are the BEFORE & AFTER photos of the room I designed...Enjoy! I purchased this Bungalow 5 chest (which was one of several donated at a very discounted price) and had it re-painted in a high gloss white (was originally off-white). I changed out the hardware to petite crystal knobs, which I purchased from Target. The acrylic lamp is also from Target. 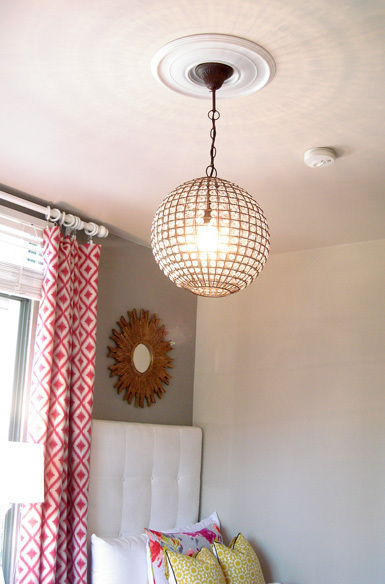 I replaced the existing ceiling light fixture (which was awful) with this beautiful round glass beaded chandelier. We added the ceiling medallion to dress things up, which made a huge difference! (only $20 from Lowes). I thought this art print added the perfect touch of inspiration to the space. 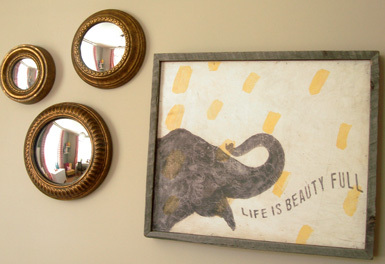 "Life is Beauty Full" by Sugarboo Designs, donated from my online shop. 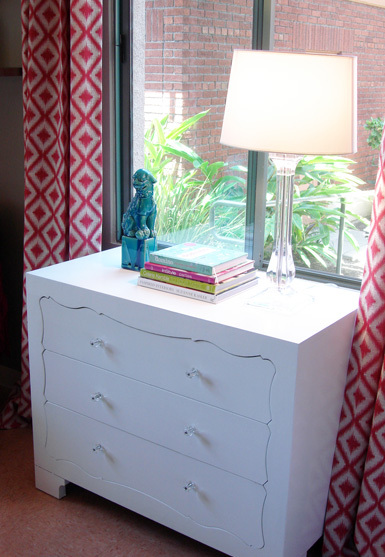 When I first started designing this project, I selected the drapery fabric first, and built the rest of the room around it. 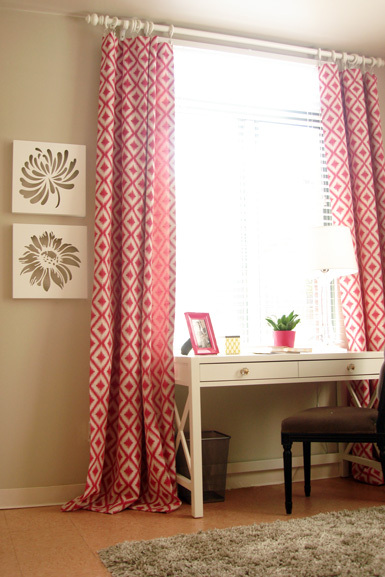 The fabric I chose was Woven Jacquard Ikat Fret Raspberry by Robert Allen. I LOVE the way the drapery panels turned out! They totally "made" the entire space. 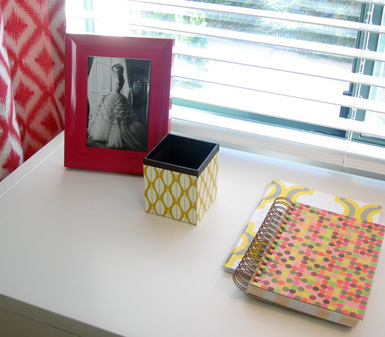 I started off with a pink, white and gray color scheme, then decided it needed a pop of yellow. 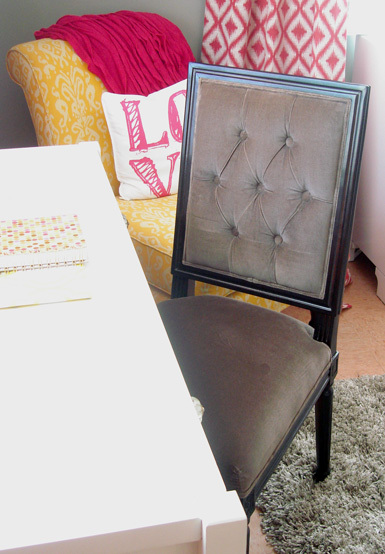 I found this amazing chair from HomeGoods at the very last minute (literally, 2 days before the project deadline)! It was like it was made just for this room! I hung a pair of white lacquered shelves from IKEA above the chair, to give the woman living in the room a place to store books, display picture frames, etc. 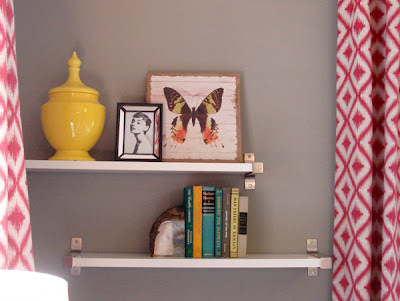 Shelves are a great way to add storage to a small space (especially if there isn't enough room for a bookcase). I wanted to create a small work space that felt separate from the rest of the room, so I placed the desk (which was a total steal from Target.com) underneath a window that faced out to a nice view. 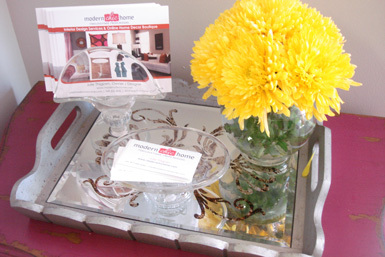 I changed out the hardware with vintage style crystal knobs - they completely transformed the look. The (2) white cutout art prints were from HomeGoods. The desk chair was donated by Bassman-Blaine and Associates one of my favorite sales agency/showrooms ever! (To-the-trade only). To brighten up the vanity area, I painted the back wall a bold shade of pink called Couture by Valspar (available at Lowes). The existing light fixture was switched out for a sweet little crystal chandelier (also from Lowes). 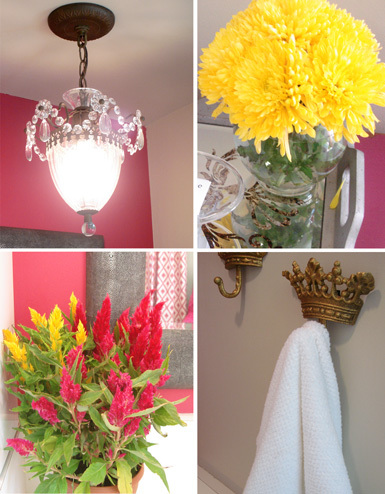 In lieu of a towel ring, I used adorable gold crown hooks, which can also be used to hang jewelry. 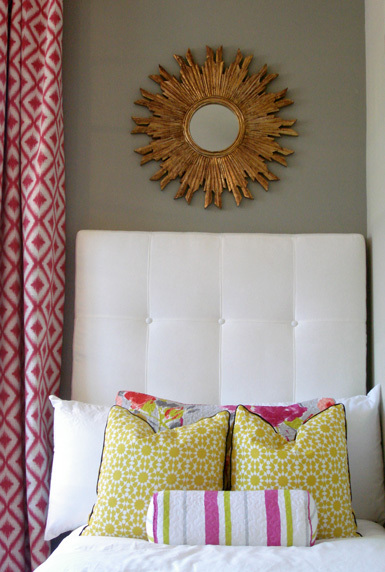 The gorgeous mirror was donated by one of my FAVORITE vendors, Made Goods (the Sabine mirror, made of faux Shagreen). 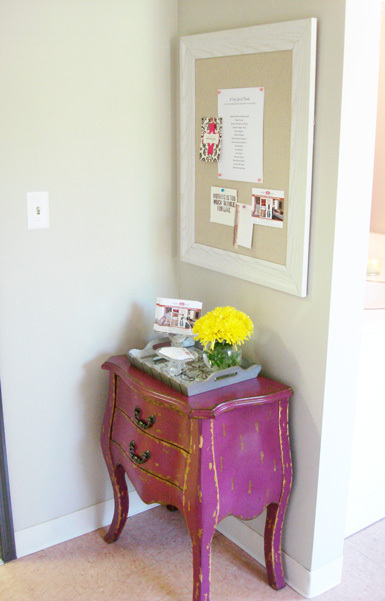 I wanted to create a small entryway upon walking into the room, so I added this magenta chest, which had a distressed finish that gave it a vintage look. I hung a bulletin board above the chest so the woman living in this room can easily keep track of her appointments, reminders, etc. Posing with new friends (and the only other designers working on this project from "the OC", everyone else was from LA). 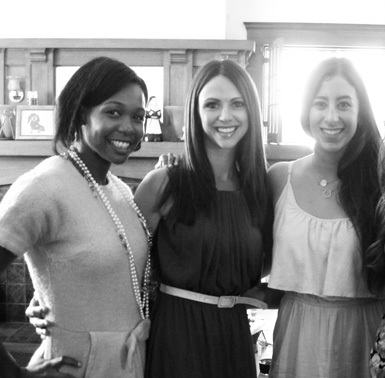 On my left, Typhanie Peterson from Shoebox Decor & on my right, Jessica from Jessica Bennett Interiors. Also, a very special thanks to my family, friends and clients for their generous donations with time and/or money. I am forever grateful. It is so amazing! I love it. So fabulous and what a beautiful and meaningful project! well done! 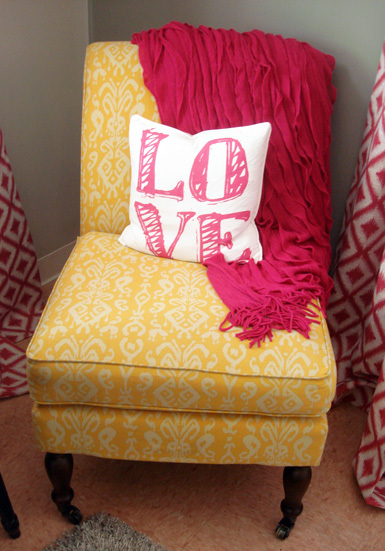 a fantastic color combo too - raspberry and lemon are so bright and happy together! You did an amazing job! Such a beautiful room! The room turned out beautiful! Thanks for sharing the after pictures! What a gorgeous room and what a kind spirit you have. I'm sure you've made a lot of people very happy. Congratulations. wow julie, that was such a transformation. like you said of the before mattress, it had the look and feel of a prison cell, non-descript, not even utilitarian, just awful really...to comfortable, positive and promising. i love your choice of all of that white, it's clean, sunny in its own way and lightens everything up. including moods ;) wish i could have been on your side of the country to help! The room looks great, I love the colours that you have used! 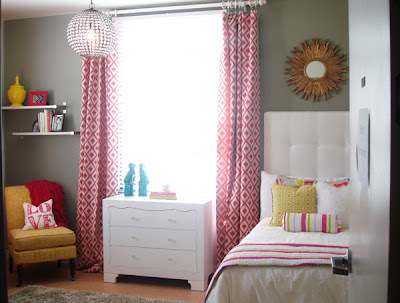 I love the makeover, it is a gorgeous room! I especially love the yellow printed chair and the chandelier. I love your choice of fabrics in the curtains & cushions as well. Gorgeous colour choices I adore the yellow chair. what a great job you have made such an amzingly beautiful room. What a transformation! You really did a great job! Love the colors and the brightness! Well done! Beautiful room! You did a wonderful job! Thanks for sharing. wow you did an AMAZING job!!! stunning! My jaw honestly dropped it looks so fab! Oh my goodness, this is insanely beautiful!! 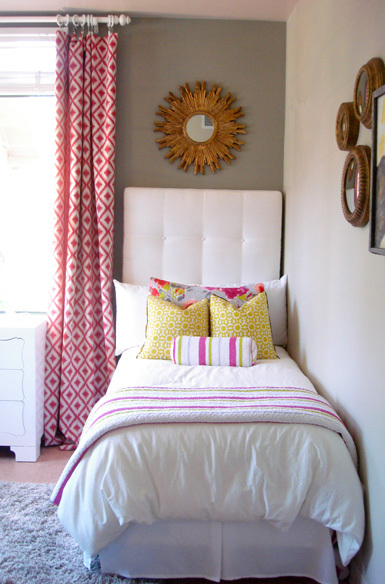 The colors, the patterns, the fabulous white headboard.....I LOVE EVERY INCH!! I'm sure whoever stays in this room is going to gain so much positive energy from it...how lucky they are! What a rewarding project! Thanks for sharing all the great photos! Wow, wow, and wow! This room looks absolutely fantastic. 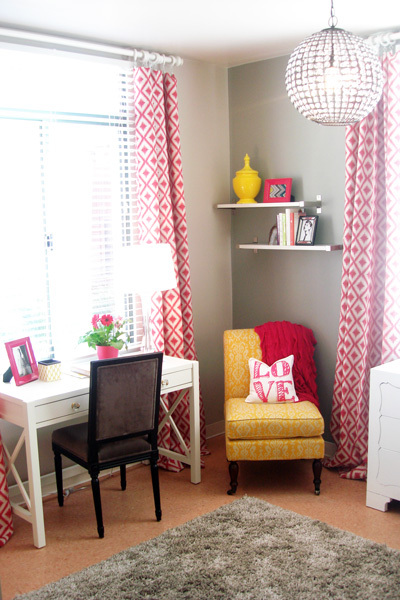 I love the transformation that you did from a generic room to something so chic and fresh. 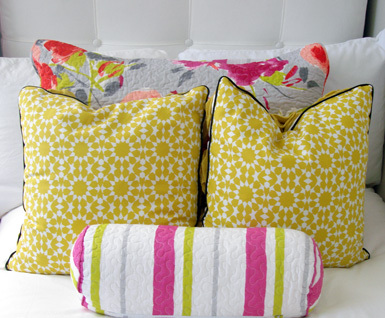 Really love the fun yellow and hot pinks that you used. It's perfect! this really warms my heart. it's such a beautiful room, but when i think about how happy you are making the woman living in it and how this love and positivity will change her life, it makes me choke up. im emotional, what can i say. Congratulations on the fantistic result Julie. I am touched that you contributed to this project. AND! I just had to share this with my readers, so I made you this weeks Hello Baby! So happy to see when designers use their talent to do good. I arrange a lot of shelter makeovers in DC and it's the most gratifying thing to do. Kudos to you and our design ROCKS! Incredible job!! You've created a space a woman can me comfortable, feel beautiful, and feel inspired in. Bravo! This turned out SO good!! 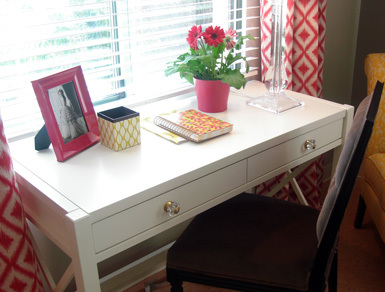 I'm on the hunt for a new desk and love this Target one! You did an absolutely fabulous job Julie! 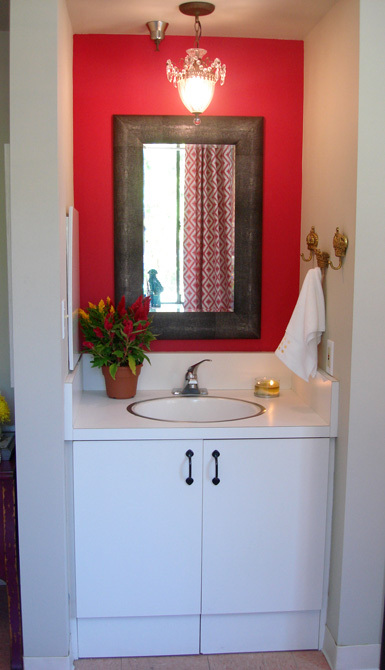 I love that the space is so fresh and vibrant (especially love the little vanity area and the reading corner). This post truly inspired me today! Fabulous. What a dynamic make-over. So many fantastic details and elegant touches. This room is beautiful Julie, and so very you! I know the woman who will be living in this home will have a bright new space filled with love and kindness to surround herself with. Looks amazing girl! 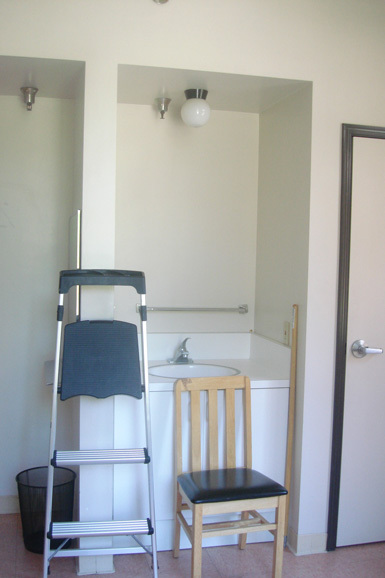 That room is very bright and cheery and is sure to lift the spirits and mood of the occupant. How rewarding to be able to participate in giving back. I think you did a fab job and I especially love how you made the room functional. The chandelier is also very fab. Congrats. The room looks fantastic. 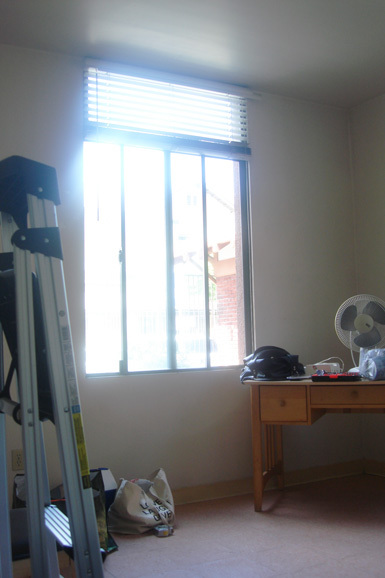 As the previous comments I love that the room is bring and cheery. My favorite has to be the headboard and the artwork. Congrats on a job well done! You and your husband look so cute together! What a beautiful room and for such a great cause! what an amazing gift you gave to these women- a welcoming little home and your talent! it is beautiful! such pretty work. its great to use your gifts to bless others. thanks for sharing. WOW. What an AMAZING job!!!! I LOVE this space! Such a great cause as well... I'm obsessing over the first round, glass beaded chandelier. Would you mind sharing where it's from? Beautiful! Where did you find the pillows for the bed? I love the colors and patterns together. I too would like to know where you found the fabric for the pillows on the bed. Thanks!